This historic old home, known as the "Bennett Place" was built in 1889-1890 by Mrs. Elizabeth Chenault Bennett. Following the death of her husband, Samuel Bennett, Mrs. Bennett purchased the lot for this home on September 13, 1888, from Mr. and Mrs. N.B. Deatherage. Construction began in 1889 and was completed within the next two years. The prominent Cincinnati architect, Samuel E. des Jardins, was engaged to draw plans for the house of Queen Ann style with Romanesque detailing. The turret with domed roof and slate roof show a strong European influence. Building of the house was supervised by Mrs. Bennett’s son, James, whose wife Sarah (Sally) was the daughter of notorious Cassius M. Clay and Mary Jane Warfield. Mr. Clay was minister to Russia during the Lincoln Administration. His family often accompanied him on his trips and it is suspected that Sally probably contributed certain ideas for the house, reflecting her European travels. This was also the home of two Bennett sisters, Belle Harris and Sue. Mrs. Belle Bennett was definitely a women before her time. She was a vital member of the women’s suffrage movement in this country and also a very important leader in the Methodist home missions. She was instrumental in the establishment of several colleges for minorities including Scarritt College in Nashville, Tennessee. 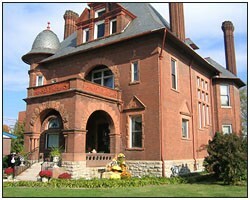 Sue Bennett College in London, Kentucky was established by Mrs. Belle Bennett in memory of her sister, Sue. Ms. Belle was also involved in organizing a local African-American organization which in 1914, brought George Washington Carver to Richmond, Kentucky.